If you have arrived here directly and not through a Council web site link, this is not a national found dog database or any Councils Statutory Found Dog Register. Only dogs collected by SDK, or notified as found to SDK by the Councils listed below, are displayed on this site. Details, and where possible photographs, of found dogs are usually uploaded to this site within one working day seven days a week and remain displayed for the legal period required. After this period, any unclaimed dogs are placed for adoption. If you recognise your dog, please click on the picture for more information, then use the contact number provided to arrange for the speedy return of your pet. Dogs can wander or even be taken by a finder to another council’s area. Please review our Lost Dogs page where we have provided further information and other sites you may like to visit. If you are unsure about which council area your dog has gone missing from, or wish alert a number of Councils, please click on the Directgov logo below which will take you to the official Government operated DirectGov.co.uk web site. Frequently checking web sites like ours for newly found dogs. Making use of the many charities which are there to help and where you can register your lost dog. Some have a network of volunteers and their web sites can increase your search area. 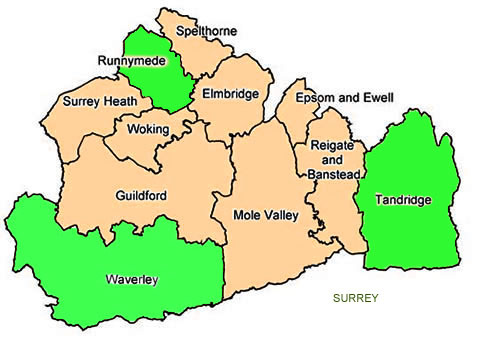 The areas shaded in green on the geographical maps show the councils that SDK covers and dogs collected by us on behalf of these councils will be displayed. If you are from an area which is not shaded or not displayed, you may want to visit the DirectGov website designed to help people with lost and found dogs and which can be accessed by clicking This website is a useful site for dogs both lost and found.